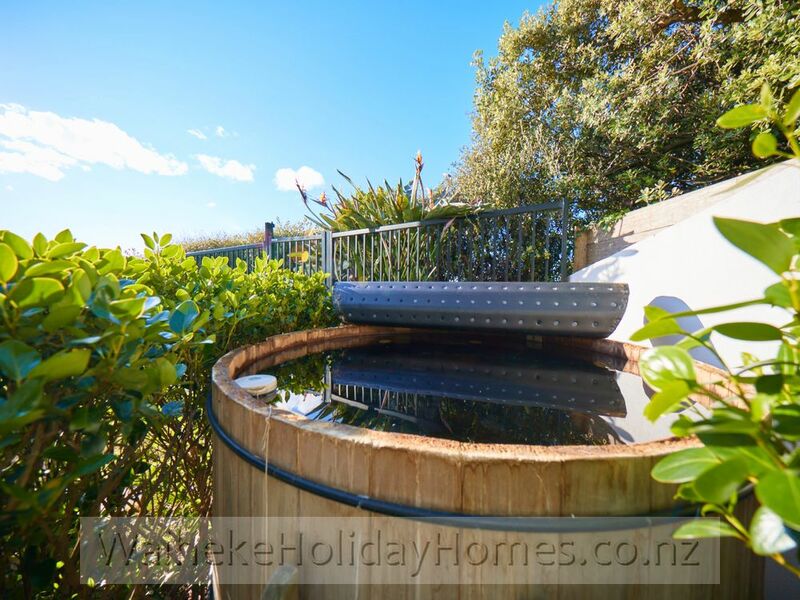 NEW LISTING!!! 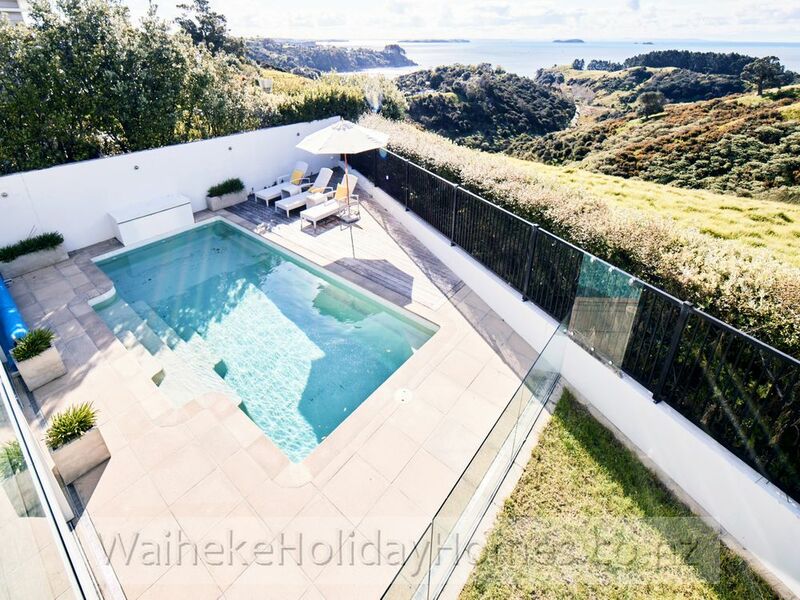 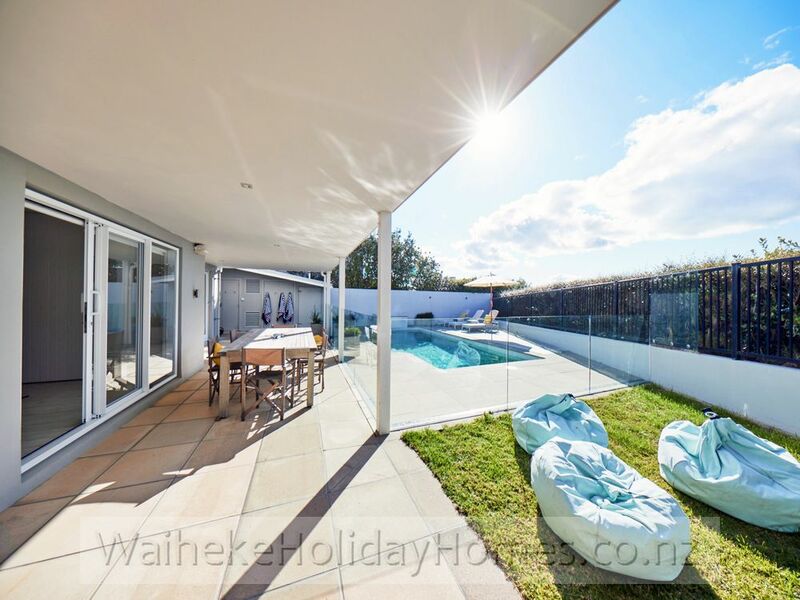 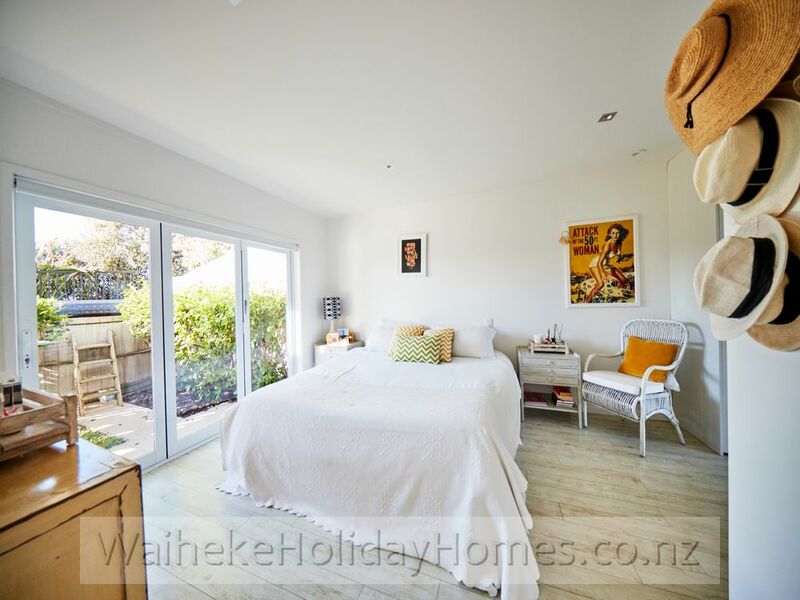 If a luxury holiday on Waiheke Island in a spacious and stylishly furnished home with huge sun-drenched decks to relax on, a pool and spa with plenty of space - and magnificent, expansive views to top it off sounds just perfect, then this is where to stay on Waiheke Island. 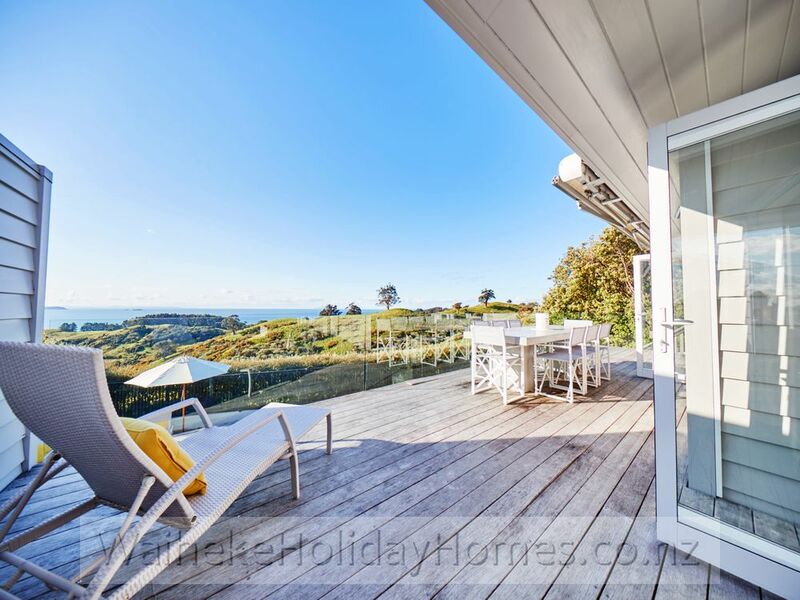 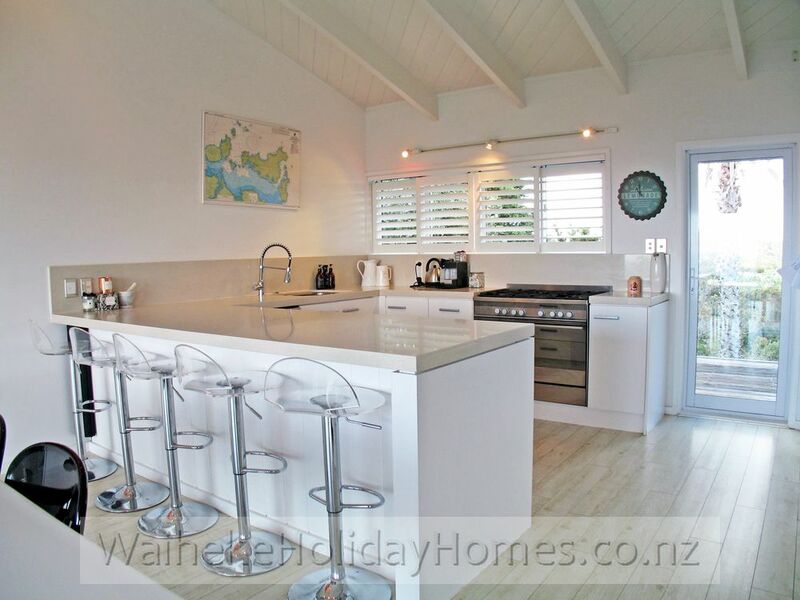 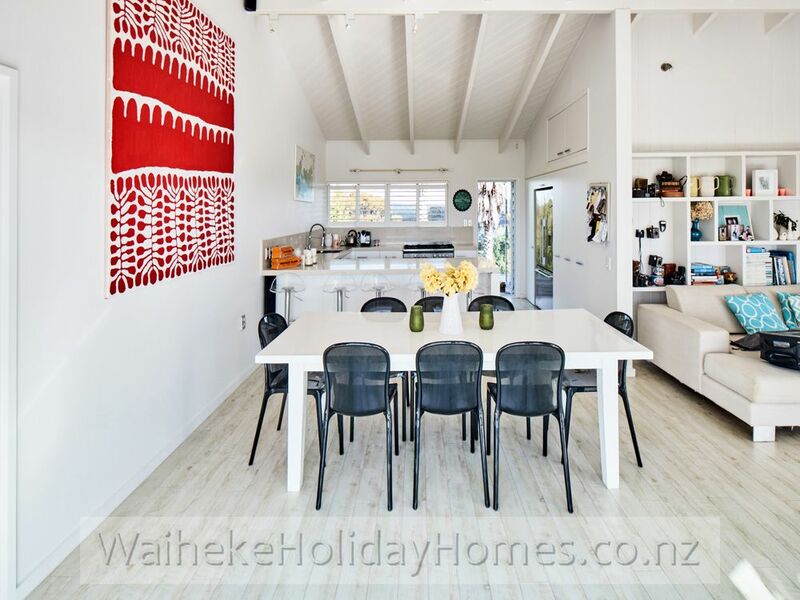 Set high near the coast of Palm Beach near Thompsons Point, this fabulous Waiheke Island accommodation provides the perfect venue for extended or several families to share. 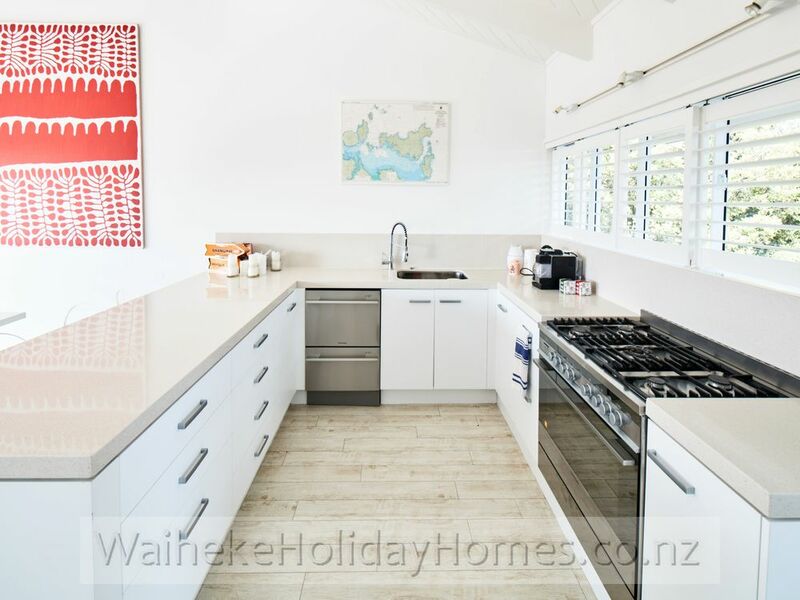 This home is lovely and private, set back from the road amongst mature trees though is still in an ideal location, central to Waiheke Island . 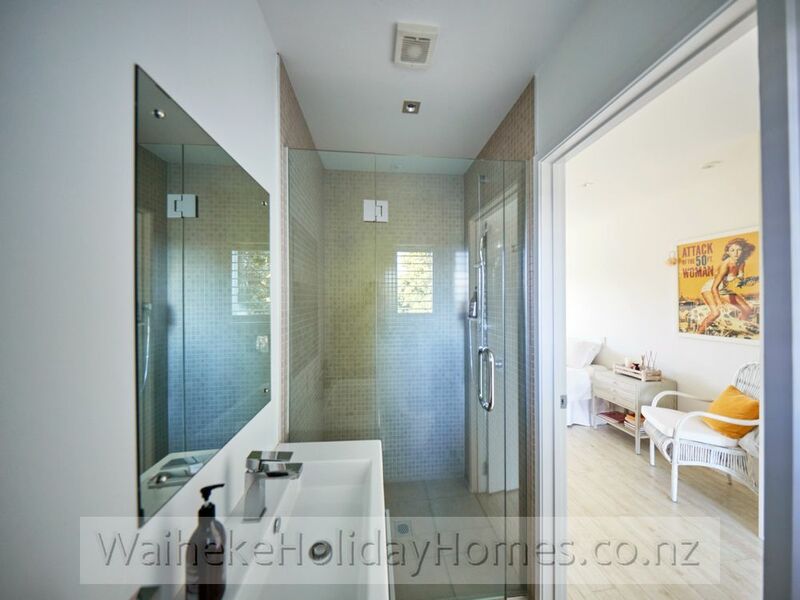 The accommodation is set on 2 levels, with the main living area, decks and kitchen on the upper level along with 2 bedrooms, an ensuite and an additional toilet. 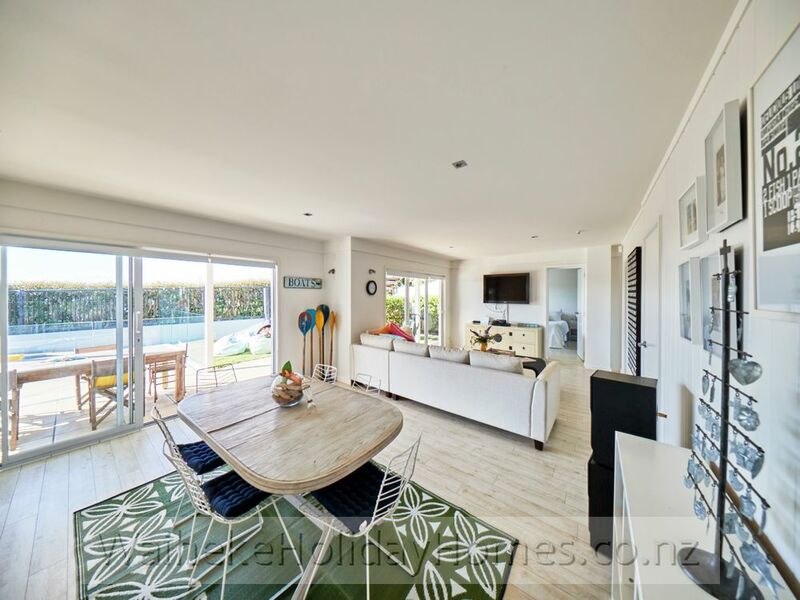 On the ground floor, you will find a second living and dining area. 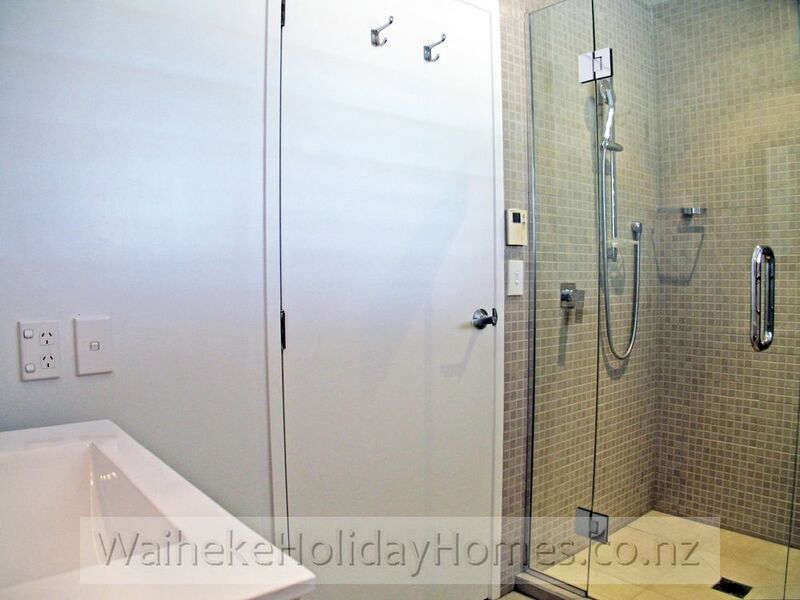 The ground floor also accommodates the main bathroom and 3 more bedrooms, one with an ensuite. 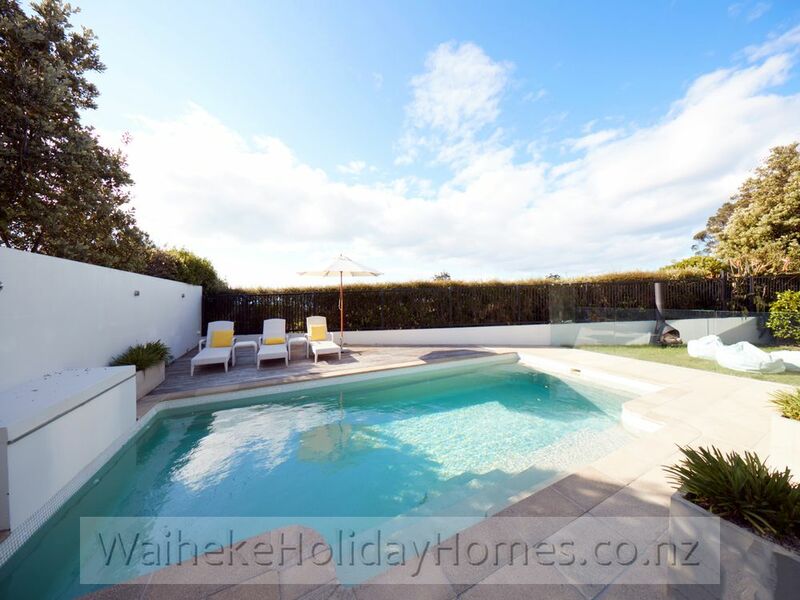 This level opens up to the pool and spa area with additional outdoor seating and an outdoor fireplace. 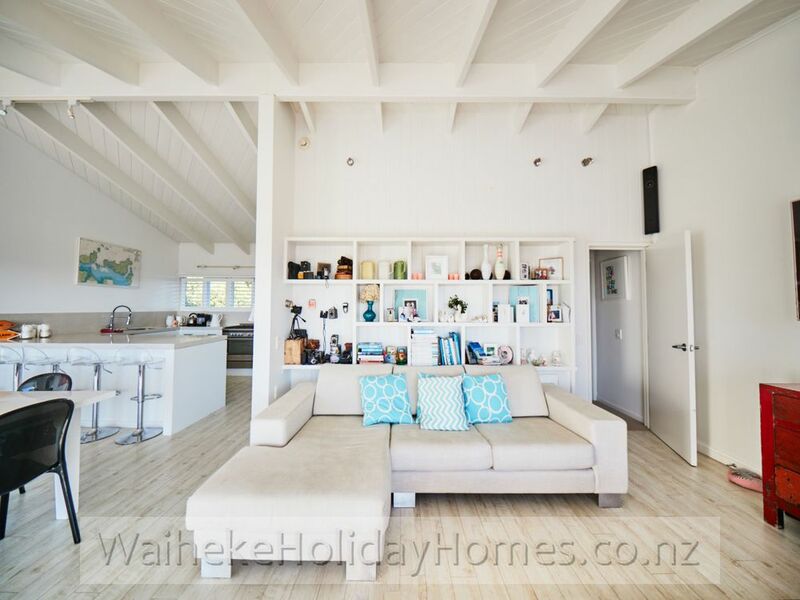 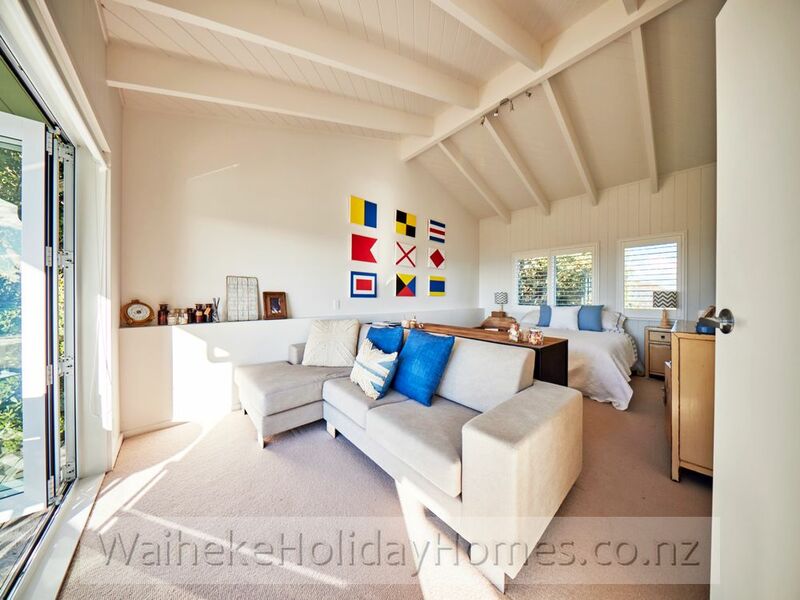 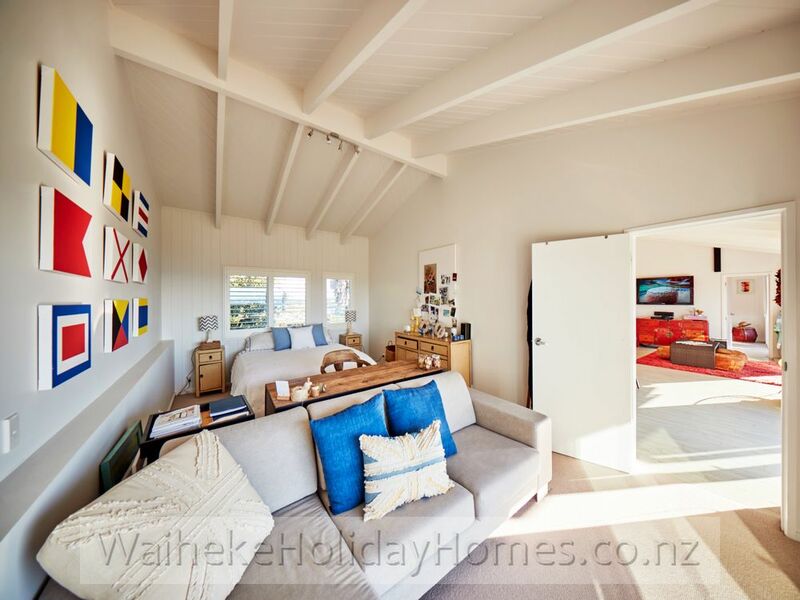 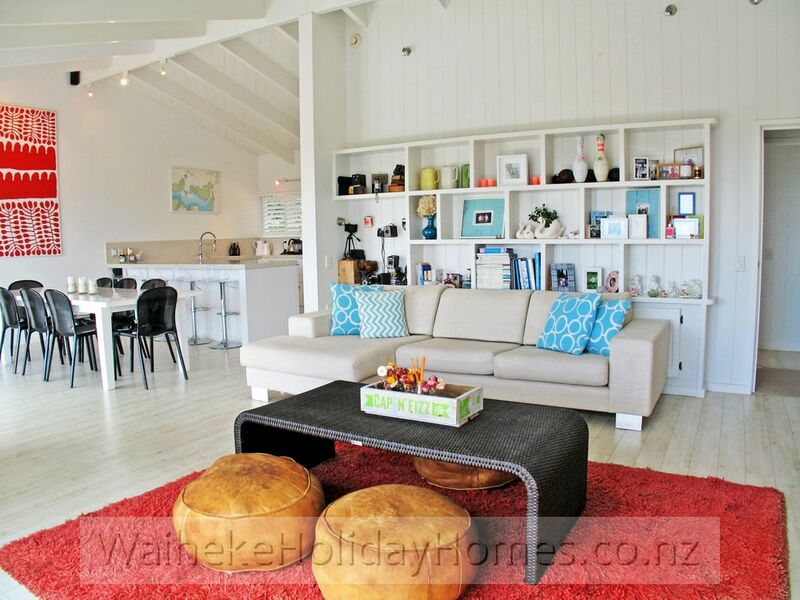 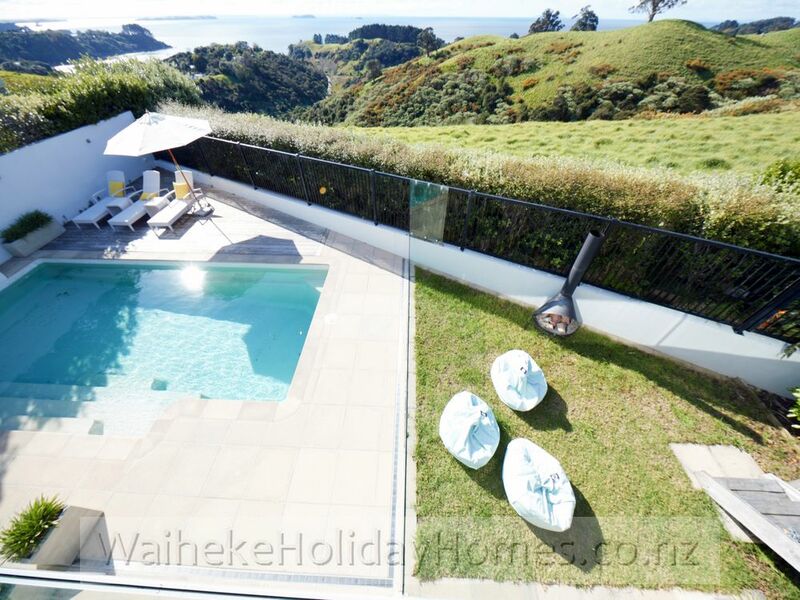 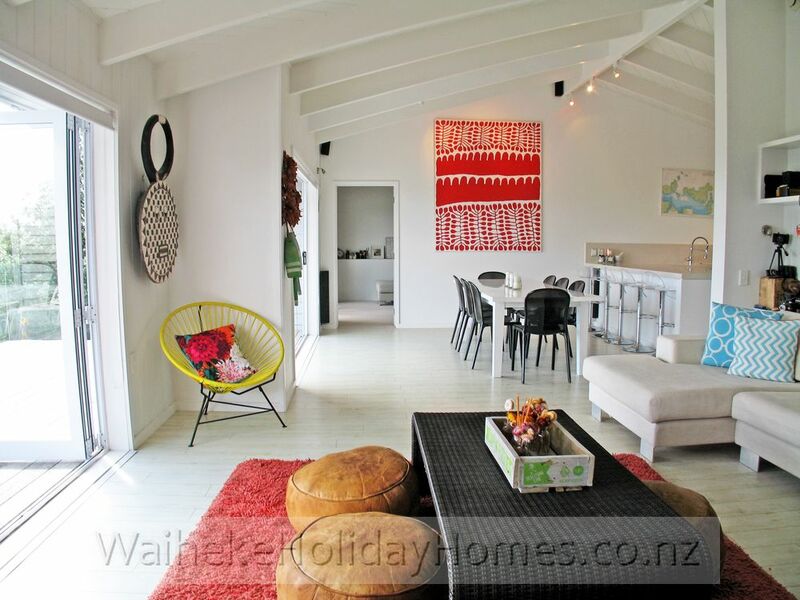 Relax at home and enjoy all that the property has to offers, while taking in the expansive views of Waiheke's waters. 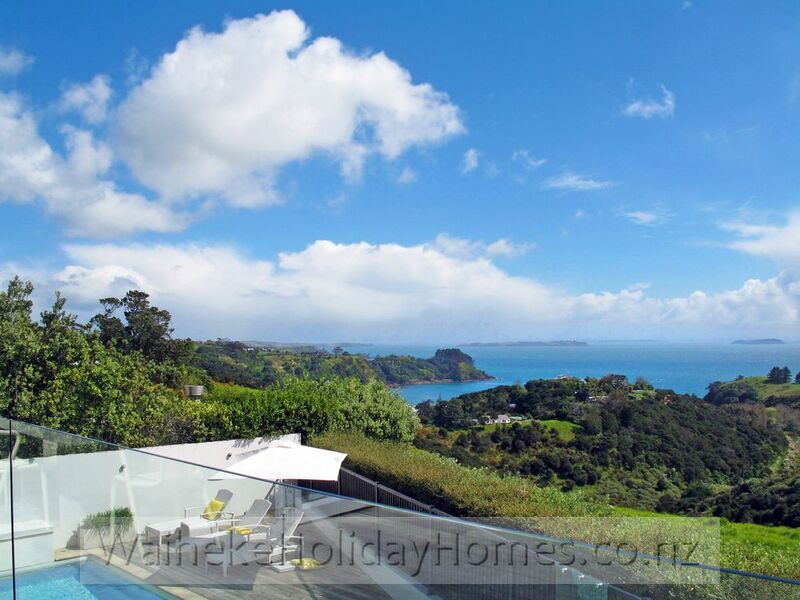 When it's time for a swim or a meander along the beach, beautiful Palm Beach, Waiheke Island there is a lovely walking track which will get you then in under 15 minutes or it is a few minutes by car. 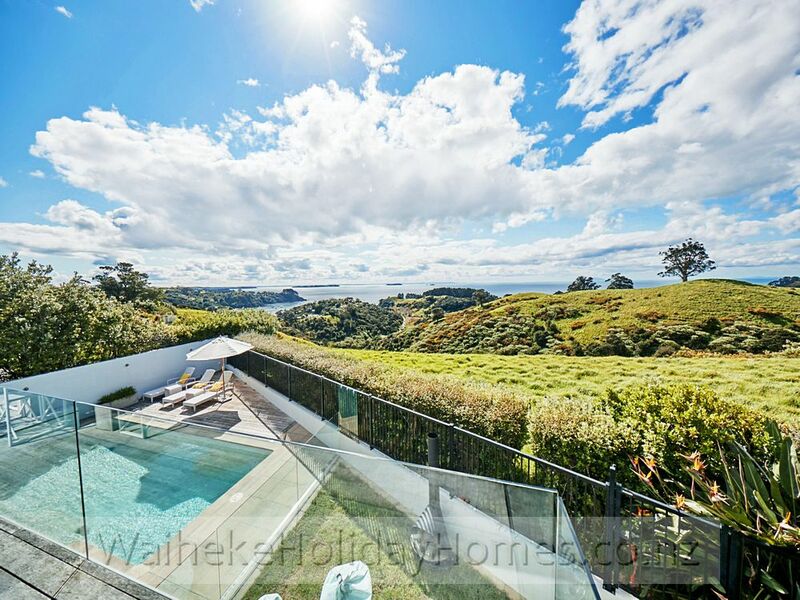 This home truly 'has it all'!! 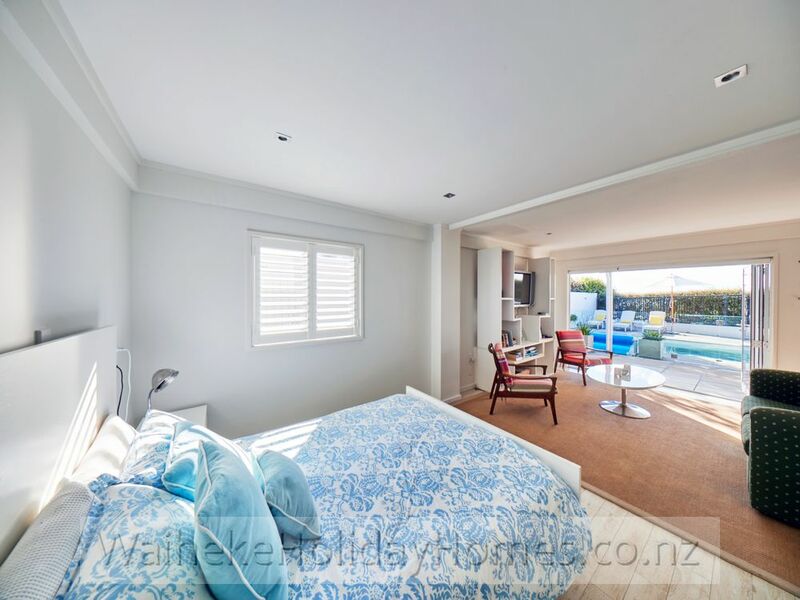 • Bedroom 1: Super king bed (can be split into singles on request - $20), bedside tables, reading lights, wardrobe and drawers. 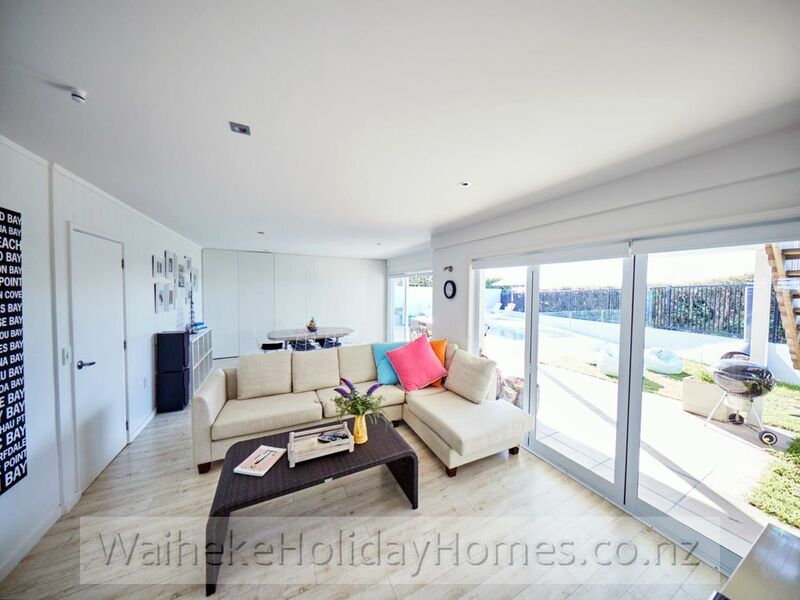 This room has external doors on 2 sides - opening up to the parking area and also the outdoor area and spa pool. 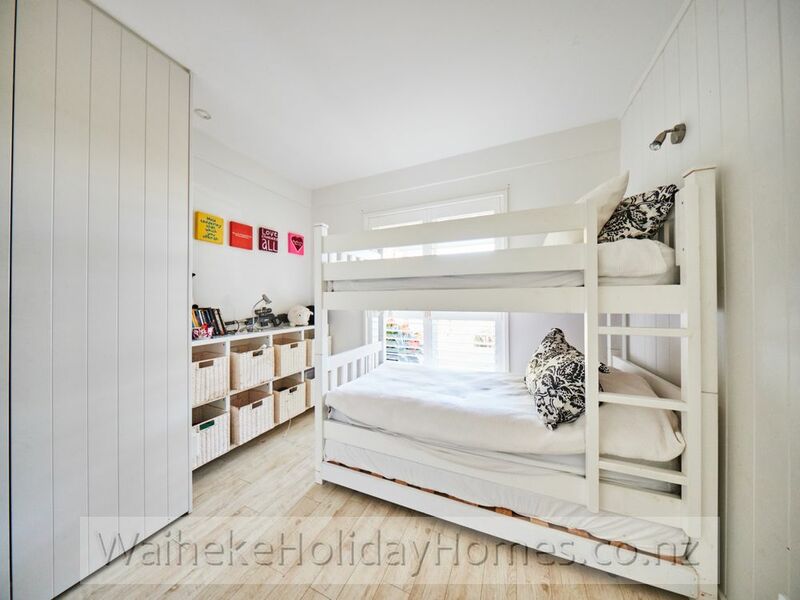 • Bedroom 3: Super King bed, bedside tables, reading lights, wardrobe and drawers. 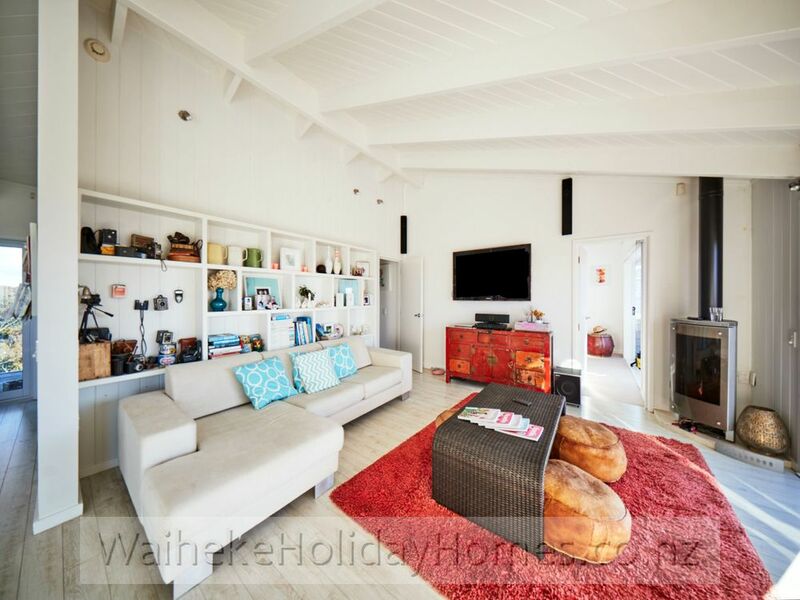 This room has it's own lounge area with King Single and Trundle (made up as sofa unless required) and TV - It also opens up to the outdoor area and pool. 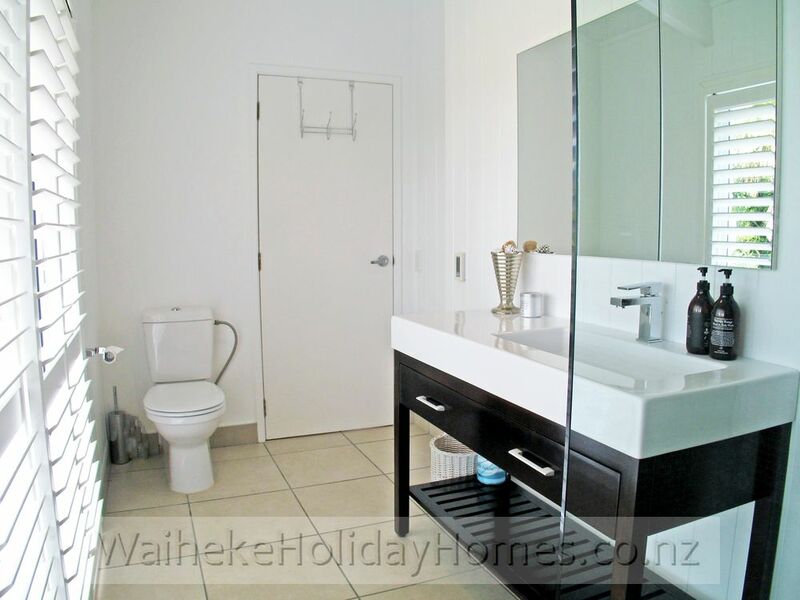 • Bathroom 2: Shower, vanity and toilet. 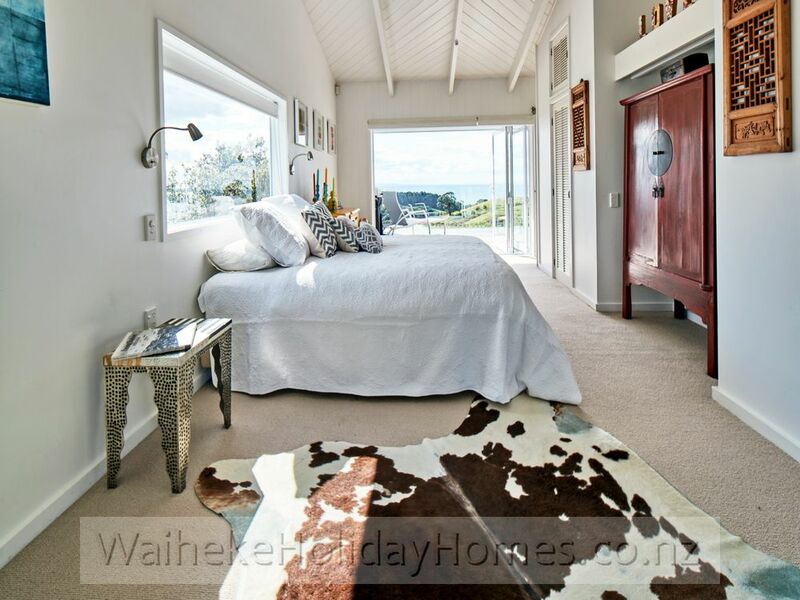 • Bedroom 4: Super King bed, bedside tables, reading lights, wardrobe and drawers. 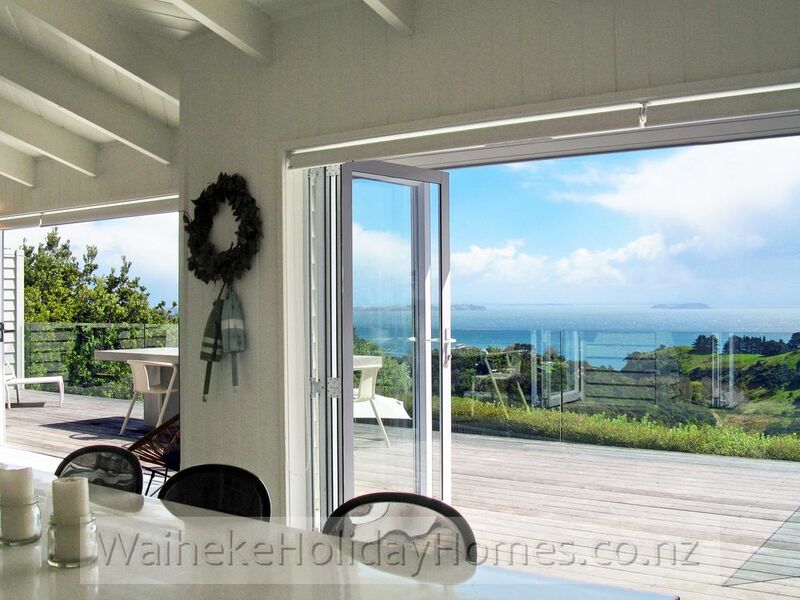 This room has external doors on 2 sides - opening up to the main outdoor deck with stellar views and also a smaller back deck. 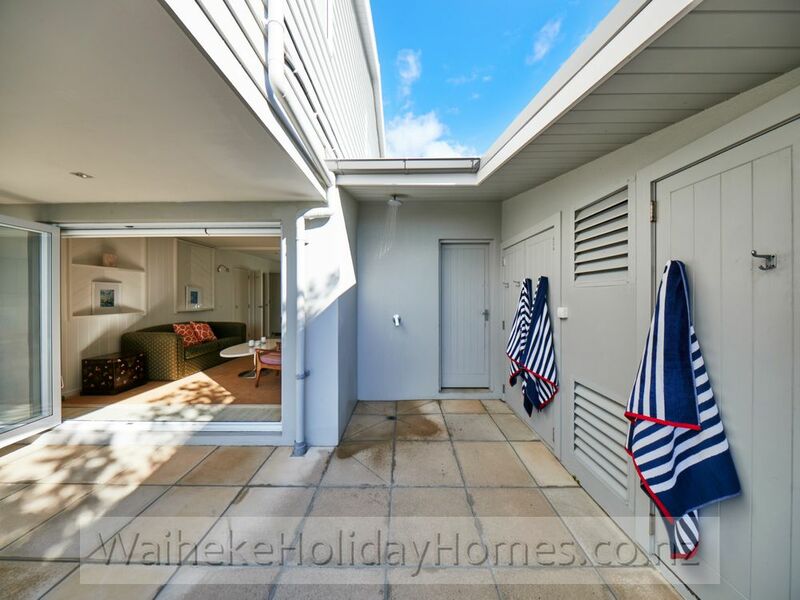 There are stairs leading from the top deck to the lower outdoor area - there is a baby gate available. 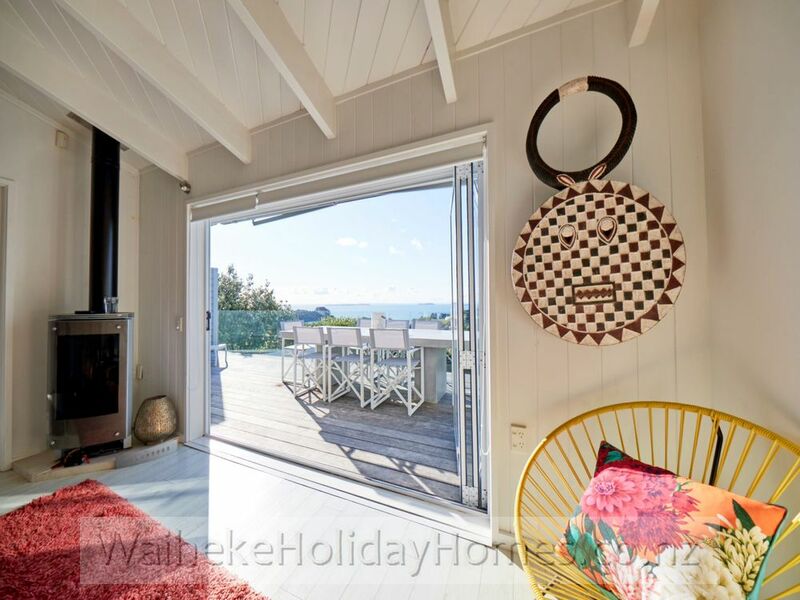 The internal stairs are open on one side with a hand rail against the wall. 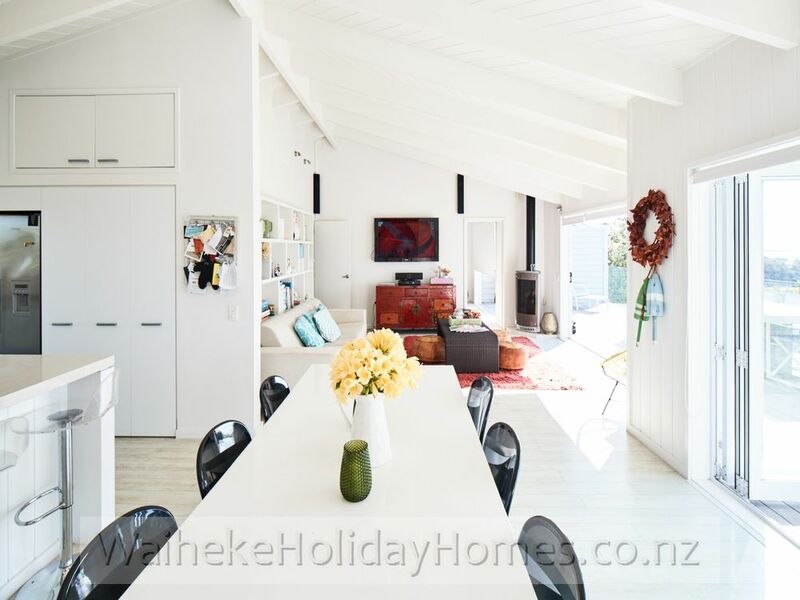 The stairs can be shut off from the upstairs living area. 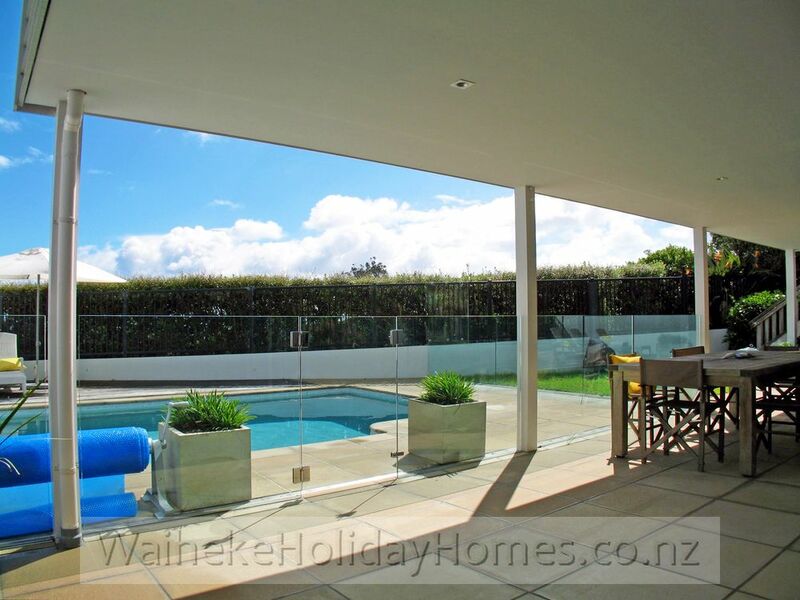 The pool is fully fenced - children must be supervised at all times when using the pool area. 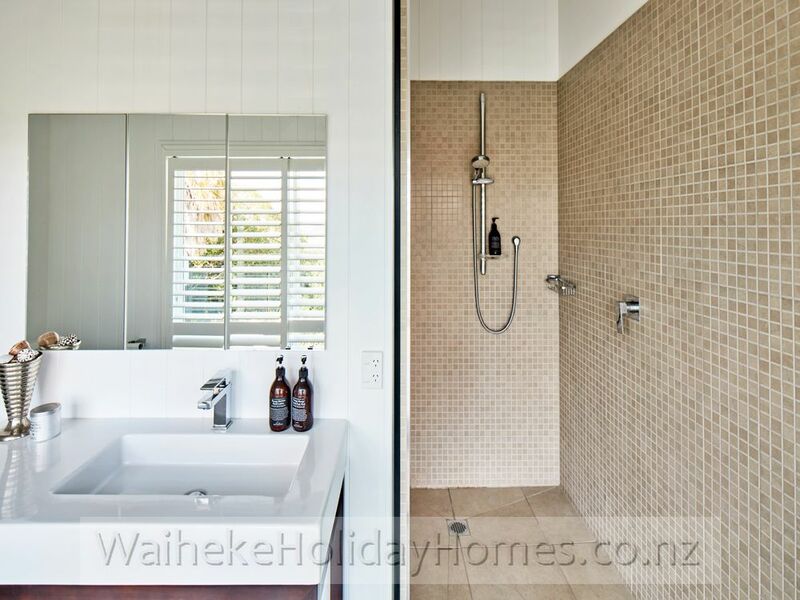 3rd Night Free Deals valid 01 May – 15 October (except Public Holiday weekends 4th night Free).